BeMountain.com ¦¦ Why a guide? Who needs a guide ? How to choose your guide ? Mountain leader or Mountain guide ? The mountain is no stranger to the guide. He accompanies you professionally during mountain tours, expeditions or during activities such as climbing, trekking, ski-touring or off-piste snowboarding. 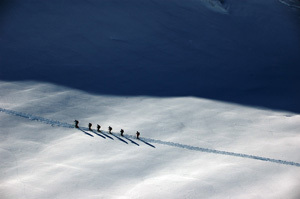 Guides communicate, in groups or individually, an intense experience of mountain and of nature. These « mountain crafters » will share their passion and be at your service with their solid knowledge of altitude challenges in places hard to conquer. In the great outdoors, especially at high altitudes, a bad decision can have large consequences. A guide, with his vast experience and theoric knowledge will take entire responsibility of the tour or the trip. From preparation to conclusion, the guide takes into account all the aspects related to security : itinerary, group conduct, progression rythm, logistics, weather conditions adaptation, avalanche forecasts etc. The guide will facilitate your approach to the region and to mountaineering activities. It's true, mountains are gorgeous, but for many mountain guides, it is the contact with participants and the dialogue with them that really matters. An available guide, who really listens will make for a unforgettable trip. He will be able to entertain your group, assure its cohesion while giving you joy and a sense of discovery that will « Free your mind » from the stress of modern life. With your favorite guide, discover, or rediscover the magic of mountains: contemplative moments, larger-than-life silences, breaths of pure air. BeMountain guides will be right beside you every step of the way. 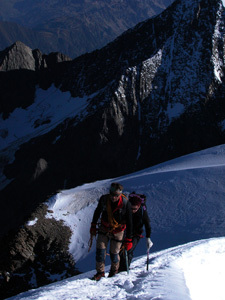 Mountaineering is the cornerstone of the mountain guide. It's up there that his role takes full spin. Author Jean Giono once said that a guide is « one who goes up first ». It is the one who shows the way. With the birth of the leisure society, the range of activities has gone beyond what's in fashion. Trekking, expeditions and high-altitude routes now include climbing, snowshoeing, ice climbing, and ski-touring. Today, sport and adventure have united with play. BeMountain offers all of these new activities. Basic tours, teaching and proficiency are also part of BeMountain's offer. BeMountain's own guiding standards guarantee more success, more pleasure and more satisfaction. There are no rules ! A guide can work with beginner clients with a few mountain experience and skills but a good physical condition that will enable them to get to the summit. On the other hand, a guide can also accompany experienced climbers in tours such has the north face of the Eiger or Matterhorn or other high-altitude routes on the world's highest peaks. Beginners who wish to try a new mountain activity or mountaineers of all levels who want to get to the next step will hire a professional mountain guide for training sessions. The goal in both is to acquire a better autonomy in the mountains. The choices are broad and cover a wide specter of difficulty. The guide will adapt himself to the level and desire of his clients. If you think that choosing a guide has to do with his looks, like cinema has sometimes shown us, you are going the wrong way. Clients often have difficulty when starting to look for a guide, especially when it comes to determining their own skill level. Nevertheless, contacting a guide is relatively simple. BeMountain helps you find and hire a guide easily. The website facilitates reservation and registration. If you already know a guide, you can see what he offers, and if you don't, you can search for a guide according to the activity and the region of your choice. To meet our Guides, click here. At crossroads between a welcoming space and a sales point, BeMountain is a pratical online basecamp where ideas emerge and projects originate. It is also a virtual marketplace for sharing and information. From there, guides take on the welcoming of the participants, the scheduling of their program and then any follow-ups required. 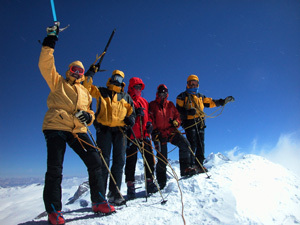 A complete tour, trip and expedition exclusive catalog offered by professionnal high mountain guides. Pictures, movies, accounts, to inspire you and to make you dream. On the field, BeMountain guides offer you two options, according to the destination, type of trip and existing client-guide relationship. A certified high mountain guide or mountain leader that truly believes in the BeMountain spirit. This person will accompany you in any of your projects, activities or destinations. During expeditions, he will most likely be assisted by a local team. This type of hire is more often based on a pre-existing client-guide relationship. A local high mountain guide or mountain leader. This person knows perfectly the region and its traditions. Sensitive to BeMountain?s spirit, he is specifically trained for our activities. Good client-guide roped parties forge themselves after a few activities together. Among guides and clients altogether, you will find Spartan climbers and Epicurian mountaineers, babblers and silent ones, TGV riders and night train travelers. For the team to work, everyone needs to find their own alter ego! When you hire a high mountain guide from BeMountain, you put your trust into a certified mountain professional, recognized by the IFMGA (International Federation of Mountain Guides Associations). Connoisseurs of their region, BeMountain guides also adhere to the BeMountain Charter, which guarantees service quality. The person-to-person relationship that exists beween a guide and its client is at the core of BeMountain. 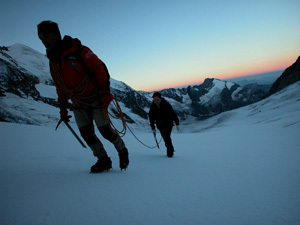 Our unique concept enables each mountain guide to present his own personalized program. This simplifies the yearly practice of renewing guiding contracts. Spanning internationally, guides member of BeMountain will offer you a broad range of mountaineering opportunities around the world. So many choices just a click away? A quick and easy way to select trips and expeditions from guides on a larger scale. You will find under Peaks catalog, the list of tours with their cost. You don't have a rope partner and you'd like to go on a specific tour ? Collective climbs will group climbers together, which helps share common expenses. You will find a vast array of activities, spanning from one day to multi-day expeditions : rock or ice climbing, snow routes, mixed activities, hut ascents,etc. Favored by many, the all inclusive formula is offered in various formats : training sessions, trips, tours and other activities. These specific offers can be found in each guide?s program. The first alpine tourists were 18th-century scientists or travelers eager to discover glaciers and to conquer peaks. They hired peasants, shepherds or even crystal seekers or chamois hunter to accompany them. They became the first guides. French mountain guide from Chamonix (1762-1834). Hunter, then crystal seeker, then guide. Most memorable ascent : Mont Blanc, on August 8, 1786. Swiss mountain guide from Grindelwald (1826 - 1898). He was first to ascent : Mönch, Eiger, Gross Fiescherhorn, Ecrins, Grand Éornier, Grandes Jorasses (west face), Aiguille Verte, Jungfrau, Täschhorn. 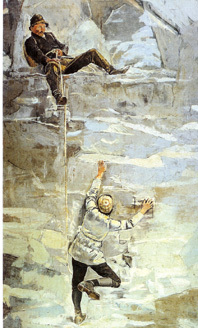 Swiss mountain guide from Saas Fee (1845 - 1910). He was first to ascent : Lenzspitze, Zinalrothorn, Dru, Zmuttgrat, Furgengrat, Strahlhorn. Swiss mountain guide from Zermatt (1835 - 1916). He was first to ascent : Lyskamm, avec Almer Grand Cornier, Grandes Jorasses (west face), Aiguille Verte. Swiss mountain guide from Meiringen (1827 - 1914). Shoe polisher and wood carver. 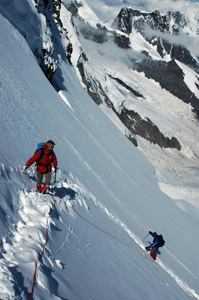 Most memorable ascent : the Brenva face of Mont Blanc (1865). Swiss mountain guide from Pontresina (1828 - 1902). He was first to ascent : Bellavista, Piz Pallü, Adamello, Piz Scerscen, Bernina, Roseg. 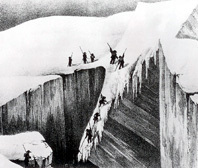 The tragic Hamel expedition (named after a Russian doctor part of the expedition) is the first mountaineering tragedy. 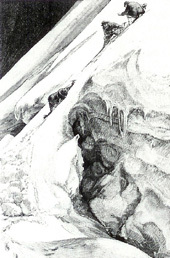 In 1820, during a Mont Blanc ascent, an avalanche kills three Chamonix guides and creates a feud regarding the client-guide relationship and guides competencies. 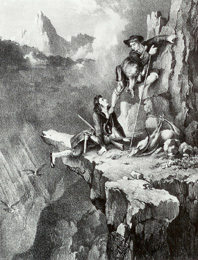 Following this accident, in 1821, the Chamonix Guides Company is created. This enables members to manage an assistance fund dedicated to guides and to guarantee their abilities. In 1858, the Zermatt Guides Company is created and then many regions follow in their footsteps. From 1854 to 1865, Alps' highest peaks are conquered. Mountaineers define this period as the mountaineering Golden Age. 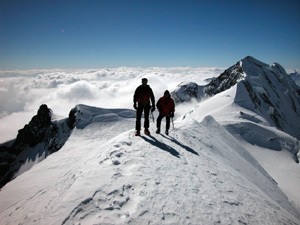 Mont Blanc was the only summit conquered at the time, so there was lots of conquering left ! This period started with the ascent of Wetterhorn, on September 17, 1854 and ended with the famous Whymper ascent of Cervin on July 14, 1865. Most 4000s were climbed during this period. The following mountain guides marked the Golden Age : Melchior Anderegg, Christian Almer, Hans Grass, Alexander Burgener, Franz Biner, Christian Klucker, Franz Lochmatter, Auguste Balmat and Michel Croz. The client-guide relationship has evolved. Until the early 20th century, the guide was almost a « specialized servant », a « bourgeois' accessory », an unpolished caracter defined by clients through his engagement and devotion. In the 30s and 40s, the guide becomes a « lord-peasant», enobled by his wiseness and mountain know-how. Guides don't sleep, they rest. A guide never falls, and if he does, it's because he's hit by thunder or betrayed by a nasty crevice or maybe a bad grip. When we find a fallen guide?s body, his hand has still a tight grip on a last piece of rock? It is also the period for great friendships : guides are hired for long periods (renewed year after year, sometimes even passed on to the next generation), which created deep, lasting friendships between the guide and his clients. Even if the formula is now rare, the friendship factor is still strong between guides and clients. This representation of this « knight of the Alps » was most popular in the 50s. Still today, guides are given innate characteristics, such as invulnerability, inalterable physical strength, intuition, orientation skills, ability to forecast weather, etc., However, in the last 20 years, the general representation of a guide has become more realistic. The mythology of a guide has shifted essentially to certification, an appreciated social recognition of the guide's abilities. Today's guide has become a partner or a teacher, who can even choose his clients, which constitutes an unusual reversal of fortune. As technical skills are still rarely discussed, clients now expect more human skills from their guides. More and more of today's clients ask for autonomy, something that did not exist before 1945, where mountaineering courses were considered a professional suicide by guides. Finally, the relationship between a guide, a client and the mountain has become largely collective (group supervision and training). Even if the guide's technical role has not changed much, there is a greater demand as far as organizing, socializing and availability. Now, the guide not only leads the way, but he also stands back to bring together the team as well as being among the group, center stage, as an advisor. Today, relationship between guide and client is both complex and simple. Simple because of closer sociocultural realities. Complex because the guide can?t stand there, at the foot of the mountain and wait for clients to drop by. In today's fast-paced world, he must constantly propose new activities and new ways of doing things. Marketing has conquered the mountaineering world ! The mountain has become a consumer good. In the past, you needed both money and time. Now that time is money, clients have less time, but more money. Clients pay for security and that?s the guide?s responsibility to accept the consequences in case of fault. A guide can do a lot of things but he can't guarantee 100% risk-free activities. He can't delete risk, but he knows how to choose between a « good risk » and a « bad risk ». 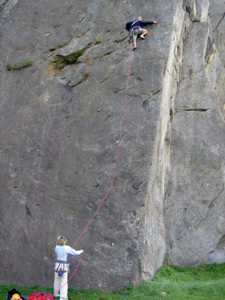 The participant has to accept that risk is an integral part of alpine sports. Mountains can't bend themselves to please consumers. Mountains are ignorant of lawsuits and lawyers. Man cannot influence mountains and that is why it teaches us so much. Recognized around the world, today's guides know no boundaries. 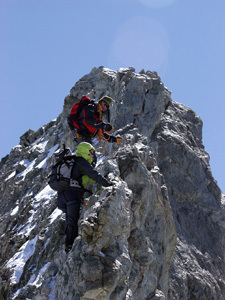 Quickly, alpine guides have created networks. Their profession taking them in neighbouring countries, guides exchange with their fellows information and techniques. The necessity to work in another's guide region has made it necessary to create common grounds in work ethics and commercial and technical know-how. Zermatt, 1965. With guide delegates from Italy, France, Austria and Switzerland, this networking dream takes place. The IFMGA (International Federation of Mountain Guides Associations)is born. The first statues are drafted in 1966. Thanks to the initiative and vision of Roger Frison-Roch (France), Toni Gobbi (Italy) and Xavier Kalt (Switzerland), the IFMGA (International Federation of Mountain Guides Associations) exists today. They made sure the profession had great freedom of expression as well as being officially recognized around the world, without any frontiers and without unecessary red tape. In these avant-garde spirits, there were ideas of unity, not only between European countries, but throughout the world. The profession has gone beyond the rules of the European Union, beyond globalization. Uniting at first alpine countries, IFMGA (International Federation of Mountain Guides Associations)is today an international organization bringing together countries such as Canada, Peru and New-Zealand. Membership is based on training, with controlled levels. IFMGA (International Federation of Mountain Guides Associations)has created a small medal that allows professional guides to recognize each other and for local guides to help foreign colleagues. In order to facilitate mountain guide's work abroad, adjust uniformally laws concerning their profession as well as their training and, as a result, issue an international identification card. When needed, manage an arbitral tribunal with an advisory function to serve as mediate in case of disputes between members and/or third parties. Study problems of general and economic nature affecting the mountain guides. Encourage close comradeship and exchange of ideas among mountain guides from all nations. Only those who have many years of experience of the mountains and who have successfully completed the demanding training course may work under the title of « certified mountain guide ». This normally consists of a three-year training course, which can be done during employment. 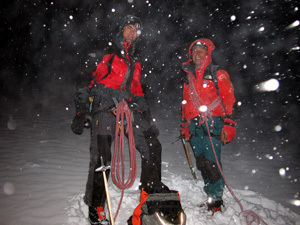 This training and the diploma issued are essential to work as a mountain guide. Training is based on various modules (winter/summer) touching on a broad range of subjects, such as climbing, first-aid, avalanches, environment but also communication and business management. Training is divided into three phases. 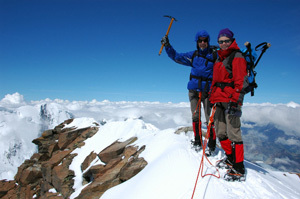 The first year consists of a course for aspiring mountain guides. 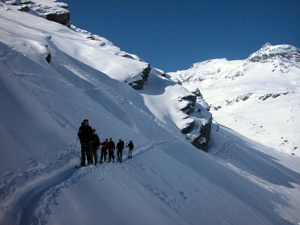 The second year includes guided tours under the supervision of a qualified mountain guide. Finally, the third year ends with the final exam, but not before writing a 5-page paper on a subject related to mountains and mountaineering. In order to guarantee professionalism in the offered tours or trips, only certified mountain professionals member of the IFMGA (International Federation of Mountain Guides Associations) or certified mountain leaders will be authorized to publish their program on BeMountain.com. The impeccable service and performance are guaranted under the BeMountain Charter. You are a professional mountain guide and you wish to know more about the BeMountain concept ? You have a particular question on how we operate? You want to become a BeMountain guide ? Do not hesitate to contact us, either by using our contact form or through snail mail. The mountain leader in middle mountain is a hiking professional that can organize, assure security and animate outdoor activities. This profession exists in France and in Switzerland. The mountain leader can accompany clients on plains or higher places, but not on ridges or glaciers. He is more of a leader than a technician. 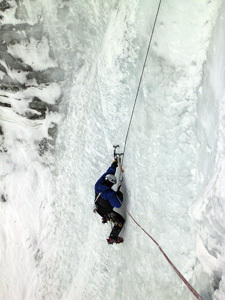 However, the mountain leader is not allowed to use technical gear during his client's ascent. During winter, he may propose snowshoeing where there is little avalanche risk. His line of action excludes haute routes and ski-touring. His activities of choice are : geology, fauna and flora, tales. He is a generalist curious of the environment phenomena. Mountain leaders are great for participants of all levels, fitting his hikes from one to multi-day activities.